By definition, an emergency happens unexpectedly. That’s why having a plan and practicing your plan is so important. In the case of a dental emergency, however, the usual steps may not be helpful. Therefore, Dr. Gray and Dr. Newman encourage patients to add our office phone number to your list of contacts on your cell phone. Then, if an emergency arises, you’ll be prepared. Whether you are from Houston or Memorial, TX, emergency dentists Drs. Gray and Newman are ready when you or a loved one needs urgent dental care. When you are faced with a dental emergency, your first step should be to call our office at (281) 493-9395. What is a dental emergency? If there is pain, bleeding or any kind of injury that has caused damage to a tooth, then you probably have a dental emergency on you hands. However, if bleeding is excessive and unstoppable, or you suspect concussion or a broken jaw, head to the nearest emergency room for proper medical care. We see all kinds of dental emergencies in our office. Knowing what to do before you arrive can often be helpful and reassuring to the patient. Here is a list of common dental emergencies and what to do in each case. There are serious and not-so serious toothaches. First, check to see if there is a particle of food stuck between two teeth. Flossing may be the simple solution to this kind of toothache. 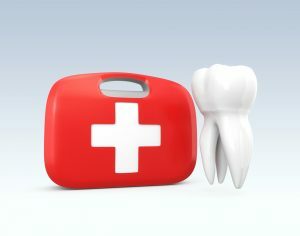 However, if the pain is unrelenting and becomes more intense, then this may be a sign that you have an infected tooth. In this case, you’ll need to schedule an emergency appointment so one of our dentist’s can examine your tooth and perform a root canal if necessary. This is probably the most obvious of all dental emergencies. Fortunately, we may be able to reimplant a knocked out tooth if you are seen shortly after the accident. Find the tooth and rinse in water. Try to touch only the crown of the tooth. If there isn’t too much bleeding, hold the tooth in its socket by gently biting down. Otherwise, the tooth can be stored in a covered jar filled with milk or mild salt water. Treatment for a broken tooth depends on how deep the break is. If the break exposes the pulp chamber, then root canal therapy may be necessary before the tooth can be restored. If the break isn’t so penetrating, then the dentist may be able to reattach the broken piece, rebuild the tooth with cosmetic bonding or encase the tooth in a dental crown. If you are experiencing any of these dental emergencies, or need advice on how to handle a particular dental situation, please don’t hesitate to call our office. Dr. Gray, Dr. Newman or one of the staff will glad to help.